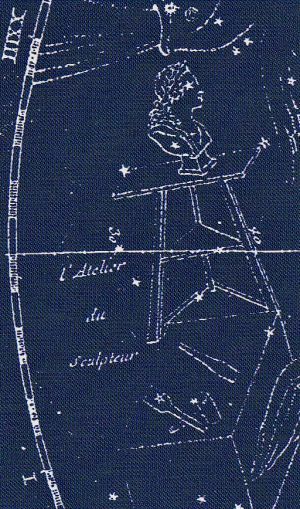 This is one side of my business-card with an image of the greatest workshop you can imagine, the constellation l' Atelier du Sculpteur. A metapfor of the endless space an artist could wish. It represents the symbol of my view on art and my field of activity. They shape like a constellation one complex unity and don't forget much more space is included between and outside those lines to discover, to research, to experiment and to see the work of colleagues.